When approaching interior design, it’s a common misconception that soft furnishings require less thought than large furniture pieces. However, soft furnishings play an integral part in laying those all-important foundations and making a house feel like a home, so they should be selected with the same careful attention you’d dedicate to choosing any other piece for your interior. Rugs have long been a signifier of luxury and bring a multitude of qualities to interiors, offering warmth and underfoot comfort as well as colour, texture and pattern. They can be used to divide spaces, define a mood or simply parade the art of tapestry across your floor. But, with the range of piles, materials and styles out there, making an investment isn’t always easy. Whether you’re after a slender hallway runner or a living room showpiece, our luxury rug buying guide will provide ideas and advice on choosing the right rug for your home. It can be hard to visualise the true scale of rugs in-store and online, so it’s essential to get the accurate size of your desired rug and the space you want it to sit in. “A rug should always be surrounded by exposed flooring otherwise it loses its effect,” advises LuxDeco’s Interiors Director Linda Holmes. Large size rugs can overpower and end up looking like a carpet, while a rug that’s too small will get lost in a room. To ensure accuracy, always use a steel tape measure and use masking tape or ribbon to plot out potential sizes to help you realise your dream dimensions. There are size guidelines to help you decide on the dimensions of the rug you need but remember that interior design shouldn’t be confined by hard and fast rules. Every space is different and this approach should be used just as a starting point. For rugs beneath kitchen or dining tables, measure the perimeter of the table and add around 140–150 centimetres to the length and width. This ensures the size of the rug is proportionate to the table and provides extra space so that chairs remain on the rug when pulled out. In a master bedroom, add at least 60 centimetres to each side that isn’t touching a wall to ensure the rug sits well past the bed frame. Underfoot comfort is bliss first thing in the morning – this size and positioning will make sure your feet hit the rug when you climb out of bed. As a rule of thumb for a living room rug in the centre of a furniture display, subtract around 60 centimetres from the length and width of your space to give you ideal rug size. If you’re using a large rug, whether your furniture sits entirely on the rug or half off is personal preference. Play around with your room setting to see what works but remember if your rug has a beautiful motif, it’s best to show off the full design. For hallway runners, measure your space and subtract around 30 centimetres from the width and 60 centimetres from the length for a neat fitting and perfectly sized rug. Next, think about the purpose of the rug and the look you want to achieve as this will help you to determine the most suitable type of rug & rug material. Rugs in areas with high footfall need to be durable and easy to clean. In less populated areas of the home, such as a master bedroom or home office, you can experiment with more adventurous and delicate fabrics. Wool rugs, along with other natural materials such as mohair and sheepskin, boast outstanding natural beauty and resilience. They’re highly insulating and carry a natural springiness, which means they maintain a fresh appearance for years. 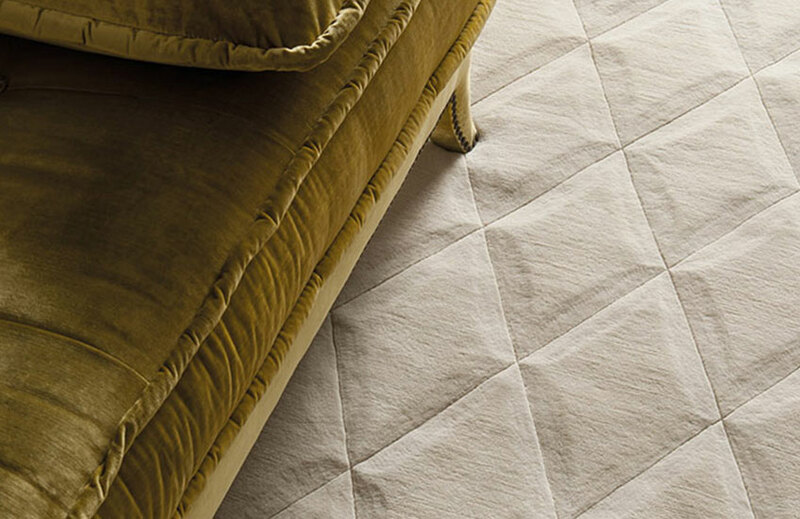 Wool’s texture allows it to recover quickly from crushing or indenting caused by footsteps or furniture, and the material has better stain resistance than the best synthetic fibres thanks to the natural lanolin that coats its surface. This coating helps to stop dirt and stains from penetrating fibres, leaving any soiling on or near the surface and making spills easy to clean. 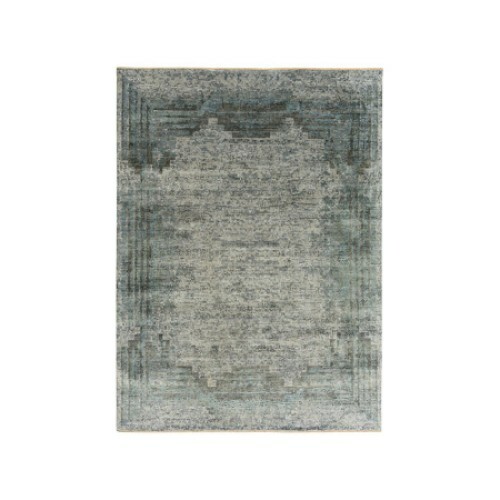 Wool rugs are susceptible to colour fading if they’re exposed to direct sunlight on a continuous basis. However, the processes used to dye wool rugs can help to increase resistance to fading. The material is also highly absorbent, which can make it prone to mildew if placed in a damp space. 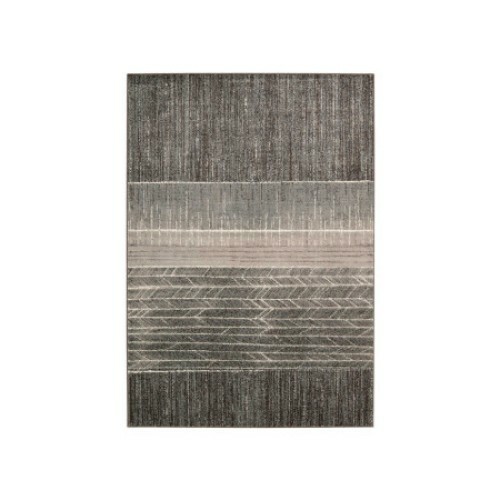 As wool is the benchmark material for luxury rugs, its price point often reflects its incredible natural properties and the skilled techniques that are required to create the designs. Real silk rugs provide untold visual benefits; their fibres set the bar when its comes to high shine and lustre. The material has been the go-to for fine Persian and Oriental rugs for centuries courtesy of its tensile strength, which enables textile artisans to weave it into tight, intricate patterns. Silk fibres also respond excellently to dying processes, boasting a beautiful ability to hold colour. Due to their delicate nature, silk rugs are better suited to low-traffic areas of the home. They are prone to collecting dirt and snagging, and they can be expensive and difficult to repair. Silk rugs also come with a high price point but this reflects their long lifespans and the high level of expertise required to create them. As a natural by-product, cowhide rugs are distinguished by natural beauty. Each skin is unique in terms of colour and pattern, which means no two designs are ever the same. 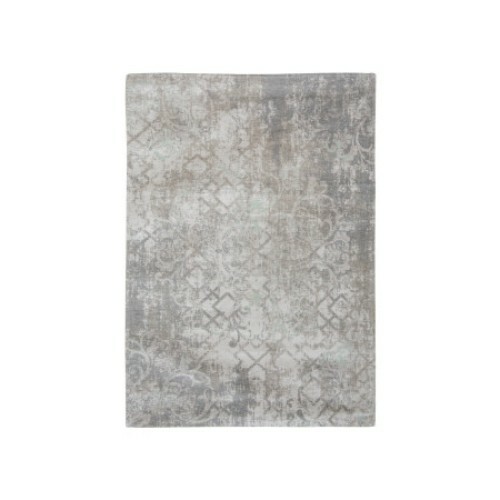 These rugs are soft yet incredibly resistant, and also have hypoallergenic properties. Thanks to their extreme durability, cowhide floor coverings last years, lifetimes in some cases. They’re easy to maintain and usually only require shaking or spot-cleaning with a damp sponge. Cowhides rugs can be vulnerable to sun fading. Whilst their natural characteristics are something to be celebrated, the unique, irregular silhouettes of cowhide rugs can be tricky to fit into compact spaces and take up unexpected room. Viscose designs can be just as beautiful as natural creations and offer a different kind of durability. Their fibres offer a lustrous look and silken texture. They’re hypoallergenic and resistant to pilling, insect damage and mildew. 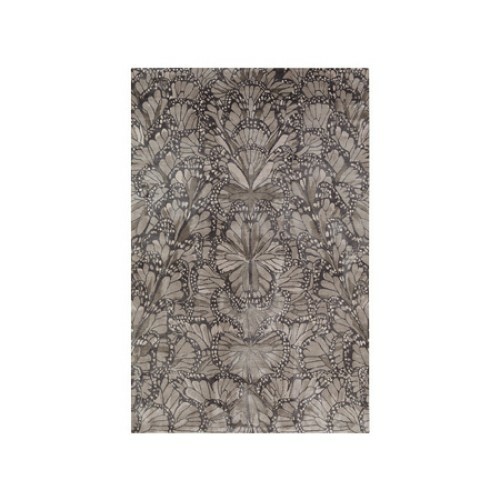 Often lightweight, viscose rugs are recognised for draping well and are easy to maintain. For daily care, simply sweep or vacuum. The manmade material can be prone to wrinkling and it loses strength when wet, which means it can be difficult to wash out stains. Viscose fibres offer less natural bounce-back and some designs may shed slightly. Short pile rugs have an extremely long lifespan and don’t flatten easily under pressure, which makes them perfect for withstanding the movement of dining room chairs. These designs also enable an more intricate pattern to be woven into their short fibres. Low piles attract less dust and hide wear and tear more so than deep-pile designs. Short pile rugs showcase a flat look and you can’t see the individual fibres as you can on a long-pile piece. This can mean that short piles designs aren’t as luxurious looking, however they are far easier to care for when compared with long-pile. Pile density also impacts greatly on a rug’s performance. Shaggy long piles can make a room more comfortable and they rarely need to be groomed. And, of course, they showcase textural depth thanks to their long, luxurious fibres. Long, loop pile rugs are vulnerable to snagging and therefore not the best option for children’s bedrooms or homes with pets, however, they are long lasting. They’re not as suitable for high-traffic areas of the home as short pile rugs. Hand-knotting is an extremely time consuming process and indicative of superior quality. The technique is typically used for fine Oriental rugs and involves using cotton warp, pile knots of wool or silk, and a cotton weft which is slotted in after every two rows of knots. In the same way high thread count signifies luxurious bedding, a high knot count is a sign of excellence. Fine rugs, which can take months or even years to create, have 400 or more knots per square inch and allow for highly intricate patterns. This process is not as complex as knotting but still provides an effective canvas for impressive designs. As the process is not as labour intensive as hand-knotting, tufted design are often more affordable. 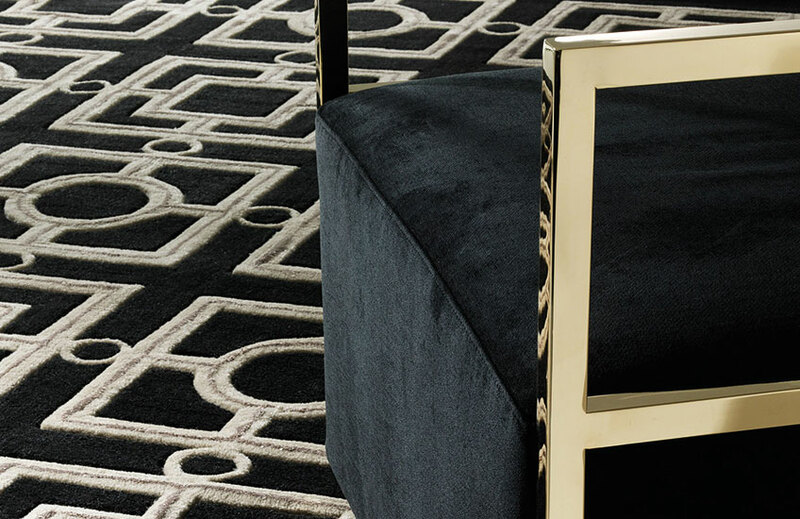 In addition, hand-tufted rugs provide durability and flexibility for exceptional design. – Blot any rug stains and spillages with cool water as rubbing can make stains even worse. Always seek specialist help for aggressive stains or extremely expensive designs. – Shag pile and loop-pile rugs should be beaten to remove dust and dirt, while hand-spun yarn rugs should be vacuumed regularly at first as they often shed. – Turn rugs regularly as sunlight can cause fading. Be wary that furniture and heavy footfall can flatten certain areas, resulting in an uneven appearance. – Rugs that are placed on wooden or tiled surfaces should be fitted with underlay to prevent slipping. Underlay also enhances underfoot comfort, extends the life of the carpet beneath, prevents natural vegetable dyes from transferring to flooring and provides extra heat and noise insulation. Remember underlay should be slightly smaller than the rug itself so it doesn’t peep out beneath.